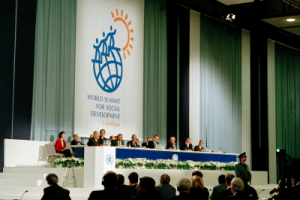 At the World Summit for Social Development (WSSD), held in March 1995 in Copenhagen, Governments reached a new consensus on the need to put people at the centre of development. The Social Summit was the largest gathering ever of world leaders at that time. It pledged to make the conquest of poverty, the goal of full employment and the fostering of social integration overriding objectives of development. At the conclusion of the World Summit for Social Development, Governments adopted a Declaration and Programme of Action which represent a new consensus on the need to put people at the centre of development. The largest gathering yet of world leaders ­ 117 heads of State or Government – pledged to make the conquest of poverty, the goal of full employment and the fostering of stable, safe and just societies their overriding objectives. Five years on, they reconvened in Geneva in June 2000, to review what has been achieved, and to commit themselves to new initiatives. Agreements: The Copenhagen Declaration, the ten commitments, and the Programme of Action. Documents: All official texts of the Summit. Statements: An archive of all 370 statements made at the Summit.